The HBO documentary examines the root cause of our decreasing life expectancy and what we can do to reverse the trend. With 8 in 10 Americans experiencing stress on a daily basis, we’re at a crisis point. Our stress is chronic, and it’s killing us. 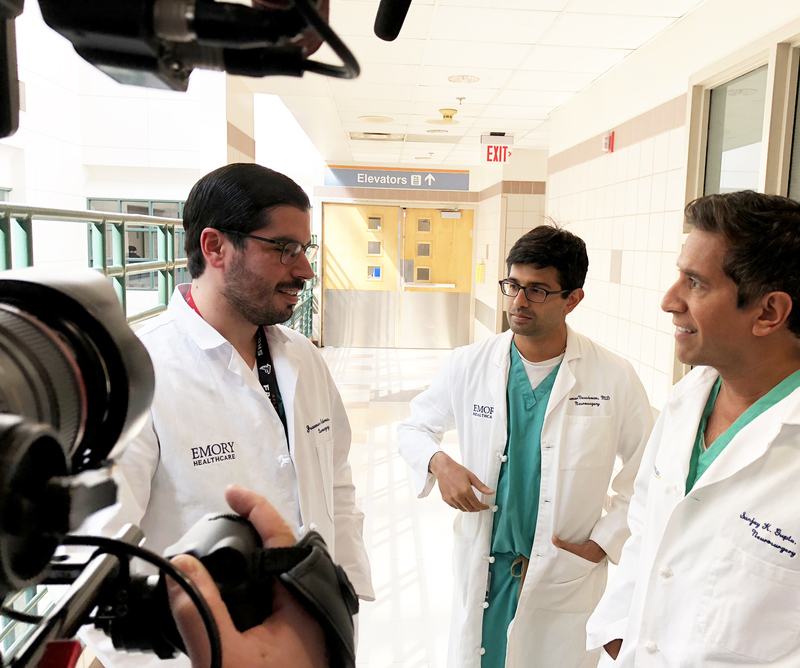 That’s the focus of the HBO documentary “One Nation Under Stress,” which features Sanjay Gupta, M.D., a neurosurgeon and CNN’s chief medical correspondent, traveling the country in search of the root cause of our rapidly declining life expectancy. As you’ve probably already gleaned from the title of the film, it’s stress. Gupta was struck by a 2017 report from the Centers for Disease Control, which indicated that Americans’ life expectancy was the lowest in a decade, thanks to “deaths of despair”: deaths caused by cirrhosis of the liver (as a result of alcohol consumption), opioid overdoses, and suicide. This stands in stark contrast to the 1960s, when Americans had one of the highest life expectancies in the world. Today the United States’ life expectancy ranks at the bottom of major developed nations, the film notes. “Enough people have died of deaths of despair to make it of the same order of magnitude as all the people who have died of AIDS in the U.S. since the beginning of the AIDS crisis,” Anne Case, Ph.D., an economist at Princeton University who coined the term “deaths of despair,” told Gupta in the documentary. At two points during the film, Gupta explains that stress in itself isn’t a bad thing. In fact, it stems from a life-saving coping mechanism. He speaks with Robert Sapolsky, Ph.D., a neuroscientist at Stanford University and the author of Why Zebras Don’t Get Ulcers, who explains that if you’re a zebra and a lion is chasing you, you want stress. So if stress was originally supposed to help protect us from predators, where did we go wrong? “Our lives are [now] psychologically corroded by stress,” Sapolky notes, largely due to instances of lack of control, lack of predictability, and lack of social support. We no longer experience stress as a direct result of being chased by a predator — it’s far more diffuse in our lives. In his travels to the Rust Belt, Gupta finds that much of Americans’ economic stress, in particular, is a result of people’s lack of control and predictability. We’ve all been sold the idea of the American Dream, where if you work hard enough, you’ll be rewarded with a decent standard of living. For many, if not most, Americans, that’s no longer the case today. “Those dashed expectations end up being the unique and really toxic factor here,” Gupta explains. In addition, there is a pervasive fear of downward mobility among the middle and working classes — which, in places like Pittsburgh and Detroit, where once plentiful manufacturing jobs have largely disappeared — has become a reality for many. Stress caused by income inequity is so powerful that it can overrule our coping mechanisms, to the point where some people pay to visit “rage rooms” — spaces where they’re given a sledgehammer or baseball bat, and are encouraged to get their anger out by smashing old TVs, plywood, and ceramic mugs. This stress is more than frustration, and more than a necessary response to predators: When we’re exposed to chronic stress, Gupta explains, it actually changes our brain and makes it difficult for us to deal with more stress. So the question is, how do we fix it? For all the sobering statistics in the first part of the documentary, the second part focuses on strategies for managing and reducing our stress. First, there’s meditation and mindfulness, which are science-backed ways to regain control of your mind. According to Rajita Sinha, Ph.D., director of the Yale Stress Center, who speaks with Gupta in the film, we have early data indicating that certain types of behavioral skills training — like mindfulness, short-term meditation, and exercise — can help damaged parts of our brain regrow. This advice supports a key Thrive Microstep (a too-small-to-fail, science-backed behavior change you can implement right away): Set aside even just five minutes to meditate each day. When you calm your mind and shut out outside noises and distractions, you’ll return to your work ready to focus and produce. It is also part of Gupta’s own stress-busting strategy of taking control of his own time, which he shared with Thrive Global. In order to keep his stress levels manageable, Gupta sets aside 15 to 20 minutes of each day to do something for himself. During times like this of decreased stress, the neurons in our prefrontal cortex — which can wither away during periods of chronic stress — can regrow. That isn’t just some warm and fuzzy Mister Rogers lets-all-get-along ideal: Research has shown that loneliness is associated with increased risk of morbidity and mortality. Fortunately, Gupta says that there is a simple solution to this problem in the form of social buffering. As shown in studies like the one in Pennsylvania, where being part of a close-knit community meant that the residents had reduced rates of heart disease, having solid social relationships helps us maintain a healthy physiology. The flipside of that is when we don’t have that social support, it can be damaging to our physical health. Ultimately, Gupta says there are grounds for hope, and room for optimism, when it comes to how we deal with stress. We have the science and the tools we need to work through this epidemic and come out on the other side. But change won’t happen overnight — it comes from consistency and microsteps. The HBO documentary film “One Nation Under Stress” is available on HBO Now, HBO Go and On Demand.